Easy to use, the MARA OLL software allows you to enter the data obtained from the survey in the field directly in the PC with a few clicks. The program automatically calculates the values ​​to be inserted into the laser transmitter and gives you a detailed overview of the earth volumes to be moved and the costs to be incurred. The 3D graphic result allows you to see the shape of your terrain and the final plane from every angle. Super productivity (-30% of land moved) and no cost for professionals for survey and project. Among the customization options of the software there is the possibility to insert the levellers and the tractor at your disposal. MARA OLL can be used with all levellers but MARA customers get more precision and a special discount. OLL is easy to use and can be installed on all Windows systems. The levellers and tractors, loaded on the software, remain in memory in the multimedia archive and can be managed directly by the user. What is the best plan to achieve? Very often the survey in the field requires the intervention of professionals in the field (engineers, surveyors) to calculate the slopes and enter the right values ​​in the transmitter. 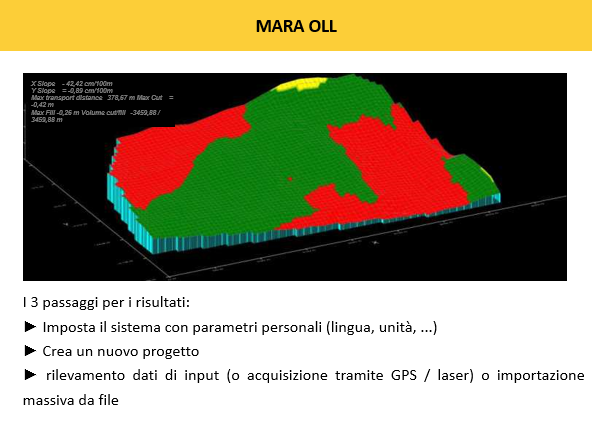 With MARA OLL all these obstacles are bypassed by technology: in a few minutes you get the ideal plan to be created, the indication of the slopes to be entered in the transmitter and you have all the technical and cost data of the project. calculation of costs and processing time.